On the same day the Minister for Defense Jeje odongo told the parliament that 10 soldiers had died. The statement added a new angle that 46 Al shabaab were killed and some captured. Al-shabaab had sent out messages that they had also captured UPDF soldiers. Last week the militants said they would soon release names of captured soldiers. 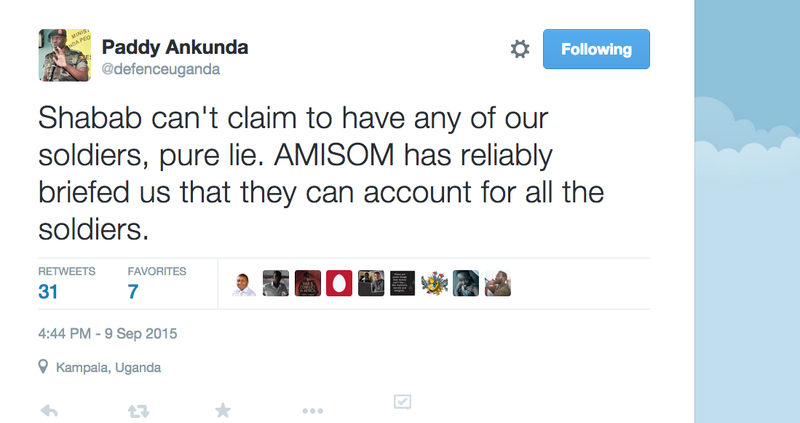 Lt. Col. Ankunda had fiercely previously refuted this as just propaganda. Four days ago President Museveni, while on official visit in Japan, told media that 19 soldiers had died in Janaale attack and that six were still being held captive. In the end the message by Ankunda that all our troops were accounted for turned out to be a lie. This is disheartening. If the president said 19 who knows how many more died and we were left in the dark? AMISOM is a 22,000-strong force backed by the United Nations and is composed of troops from Uganda, Burundi, Kenya, Ethiopia, Djibouti and Sierra Leone. Many in Uganda continue to rely on rumours and speculation regarding numbers. 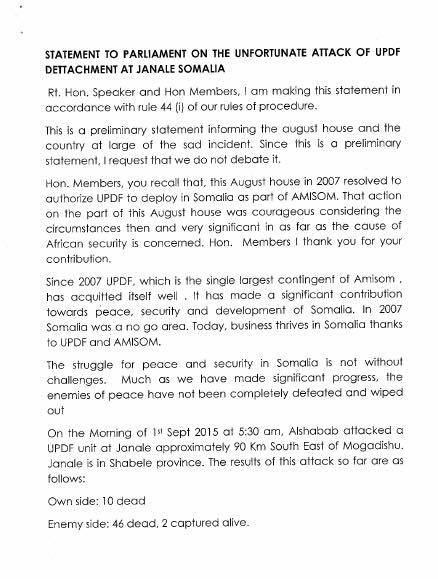 AMISOM ought to be more transparent regarding the mission in Somalia. A lot has been achieved but more questions remain especially in the regard to the last two attacks in terms of accountability. Governments and the African Union owe the troops, their families and citizens the truth. For now the cost of fighting Al shabab remains a guess and those with family serving in Somalia can only wonder if their relative one of the captured. We all know the barbaric acts of Al shabaab when it comes to treatment of captured soldiers. Official figures of killed troops remain dwarfed as governments and AU try to keep questions away. Back in Uganda, what is worrying is the media seems to have not moved beyond official statements. And with the passing of Gen. Aronda Nyakairima and the speculation that has followed – may he rest in peace- the news media have moved onto the next ‘big’ story. No one is asking what is being done to ensure these soldiers who are still being held by Al-shabaab are rescued. Don’t get me wrong, I do not expect public display of details of AMISOM military strategies but the fact that these soldiers are not featuring in our news means not much will be known of their plight. I hope these soldiers who bravely serve our country get the deserved attention. Hope they will be brought back safely to their families who are living in agony and those who died while serving can be duly honored. The struggle for narrative, figures and account of what exactly happened in these attacks continues. For now all we know President Museveni is quoted to have told Japanese media that the Janaale attack happened because “commanders were asleep.” Quite a damning statement coming form a head of state.